According to the Associated Press, Iran's aerospace program announced today that it plans to launch a Persian cat into space by March. The Iranians have sent a mouse, a turtle, some worms, and even a monkey into space. But this real-life Space Cat would be the first feline to journey out of Earth's cozy confines in nearly 50 years. The first cat in space was sent up by the French on October 18, 1963. 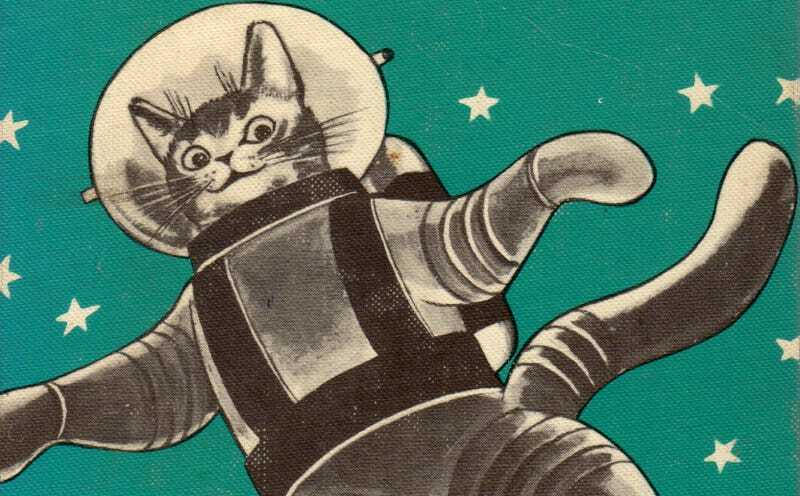 A stray named Felicette, the first furry catstronaut was said to be picked up from the streets of Paris. The French had first planned to send a cat named Felix, but there are conflicting reports about what happened to this would-be explorer. Some people think Felix escaped, and was replaced at the last minute by Felicette. Curiously, some histories still credit Felix as being the first cat in space and there's considerable confusion about who exactly should take credit. Regardless of how she got there, Felicette was thankfully retrieved unharmed after her capsule reached 100 miles into the heavens, then parachuted gently back to Earth. The French followed up with a second cat just a week later, whose fate was decidedly more grim. And no feline has reached space since. While dogs, monkeys, mice, and bugs have been relatively commonplace in space, Iran's choice of cat is unorthodox enough to merit attention—which is no doubt part of what informed the decision. The country has courted animal astronaut controversy before; questions arose about the fate of its space-faring monkey after the photos the country released from before and after its voyage appeared to show two different animals. Iranian officials denied that they were attempting to cover up a failed flight. The world owes a lot to the animals sent into space throughout history. But animal space explorers are also inevitably used as a political football. Adversarial countries (like the U.S. and the Soviet Union in the late 1950s, or say, the U.S. and Iran today) have often used the opposing side's animal testing as a way to make them look inhumane. Even back in 1957, when the Soviets launched the first dog into space, there were protests in the United States (some earnest, some undoubtedly politically motivated) about the suffering that Laika was surely enduring as she made history. If the Iranians do indeed go through with their launch, here's hoping their Space Cat returns safely. With any luck, at the very least we may get a remake of that 1978 Disney movie out of it. Thanks to @burritojustice for the tip.